The Blue Mosque is located in Istanbul, Turkey, but it wasn’t always a mosque. Before becoming a mosque, it was the mother church of the Byzantine Empire. In 1453, the church fell under the Turkish and at that point it became a mosque. It attracts large numbers of visitors each year. The temple houses various exhibits and museums. 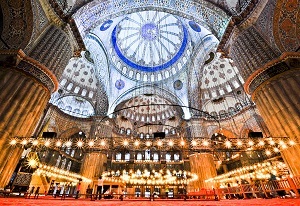 The construction of the Blue Mosque began in 1609, on the instructions of the 19 year old sultan, Ahmet I. Its designer, Mehmet Aga, took seven years to complete the project. The temple can be approached from three gateways that all lead into a row of columns holding up the roof. Beyond the gateways there is a roof made of 30 small domes. Under the roof, in the middle of the courtyard, stands a hexagonal fountain. Light, from 260 windows shining on the tiles, spreads throughout the mosque, makes the floor shine brightly. The floor is mostly covered with thick carpets that are usually deep red that mix with the blue tiles, the combination causes an impact that is mesmerizing. The elegant ceramic work is the product of Iznick factories that achieved success during the 16th century. One of the museums has collections of Usak, Bergana, and Konga carpets that are dated between the 16th through the 19th century. Turkish carpets from the 13th to the 20th century are displayed along the ramp, which forms an entrance to the pavilion. The pavilion has many rooms created for the sultans who used to relax there. The Blue Mosque is a beautiful place to visit. The dazzling tiles and lovely fountain helps make the Blue Mosque so gorgeous.